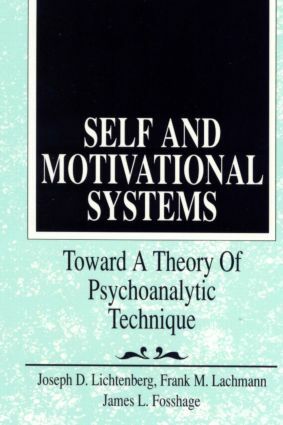 Motivational Systems and Other Basics. Model Scenes: Implications for Psychoanalytic Treatment. Model Scenes and the Search for Clinical Truth. Human Development and Organizing Principles. Unconscious Mentation. The Path to Awareness. The Interpretive Sequence. The Selfobject Experience. Defense, Conflict, and Abuse. Values and Morality. Toward a Theory of Technique. Joseph D. Lichtenberg, M.D., is Editor-in-Chief of Psychoanaytic Inquiry, Director Emeritus of the Institute of Contemporary Psychotherapy and Psychoanalysis, and past President of the International Council for Psychoanalytic Self Psychology. He has authored and edited numerous books and articles, including Craft and Spirit: A Guide to the Exploratory Psychotherapies (Analytic Press, 2005) and, with Frank Lachmann and James Fosshage, A Sprit of Inquiry: Communication in Psychoanalysis (Analytic Press, 2002). Frank M. Lachmann, Ph.D., is a founding faculty member of the Institute for the Psychoanalytic Study of Subjectivity, Training and Supervising Analyst, Postgraduate Center for Mental Health, and Clinical Assistant Professor at the NYU Postdoctoral Program in Psychotherapy and Psychoanalysis. He has contributed over 100 articles to the journal literature, and is author of Transforming Aggression (Aronson, 2000), and co-author of Self and Motivational Systems (Analytic Press, 1992), The Clinical Exchange (Analytic Press, 1996), and Infant Research and Adult Treatment (Analytic Press, 2002). James L. Fosshage, Ph.D., is Cofounder, Board Director, and faculty member, National Institute for the Psychotherapies, NYC; founding faculty member, Institute for the Psychoanalytic Study of Subjectivity, NYC; and Clinical Professor of Psychology, New York University Postdoctoral Program in Psychotherapy and Psychoanalysis.